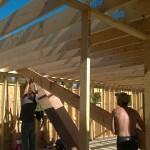 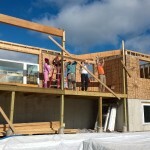 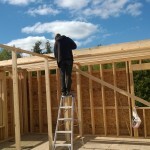 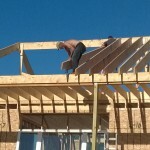 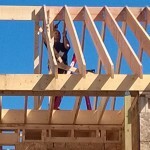 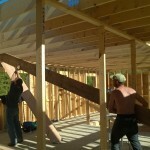 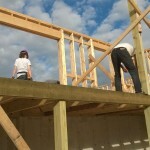 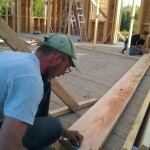 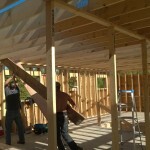 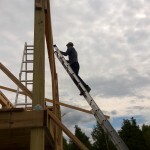 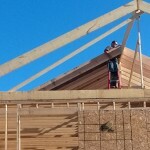 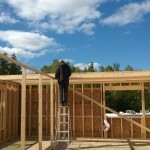 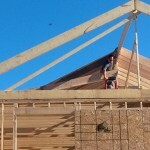 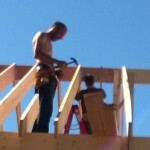 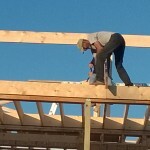 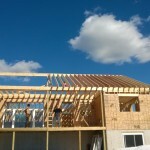 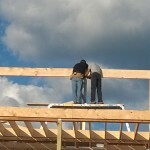 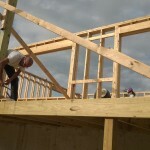 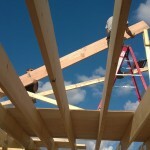 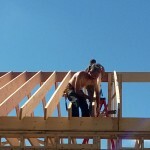 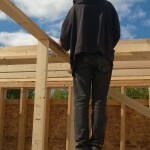 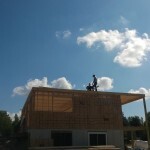 Today, my brother-in-law Tom came up from Vermont to help out, so we started working on the roof rafters. 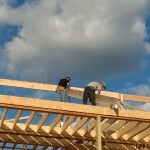 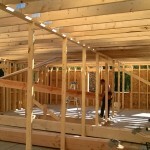 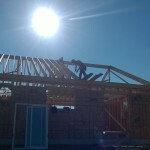 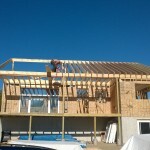 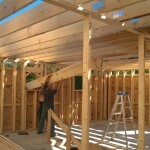 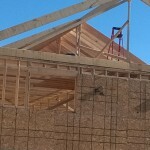 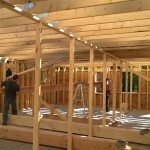 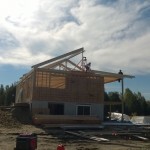 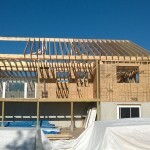 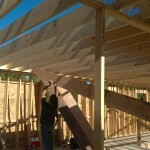 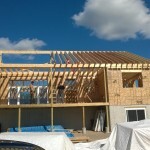 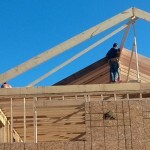 We were able to get the ridge beams installed on temporary supports, and put up two of the roof rafters to get started. 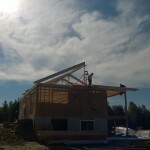 All in all a huge day, and feels like we are getting closer to the end now! 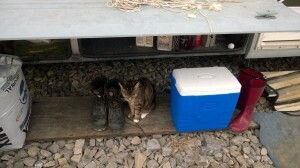 Take care and thanks for reading! 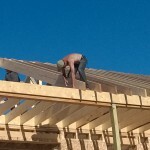 Supposed to be another fine day for working tomorrow so we will continue with the roofing rafters and see how we get along. 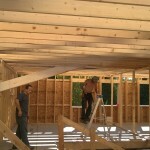 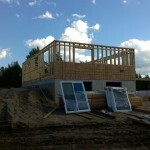 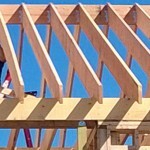 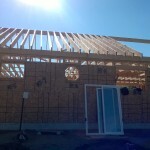 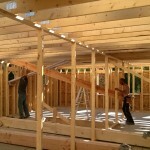 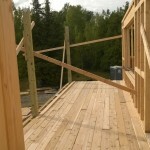 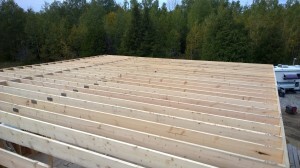 More of the same today, just continuing with the attic joists, trying to get it done so we can start the roof framing! 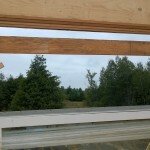 This morning there was a solid covering of frost over everything outside, so it’s a good reminder that summer has long passed and fall is steadily marching towards winter. 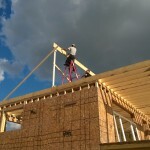 Thanks for reading and hopefully the weather will hold so I can get more good work done tomorrow! 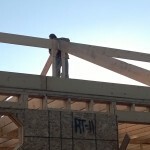 Today we started working on the attic joists. 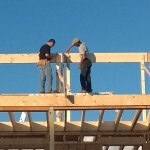 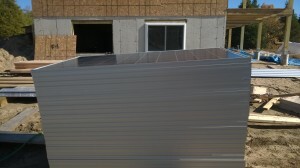 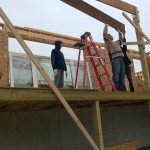 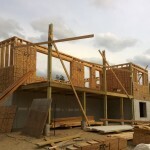 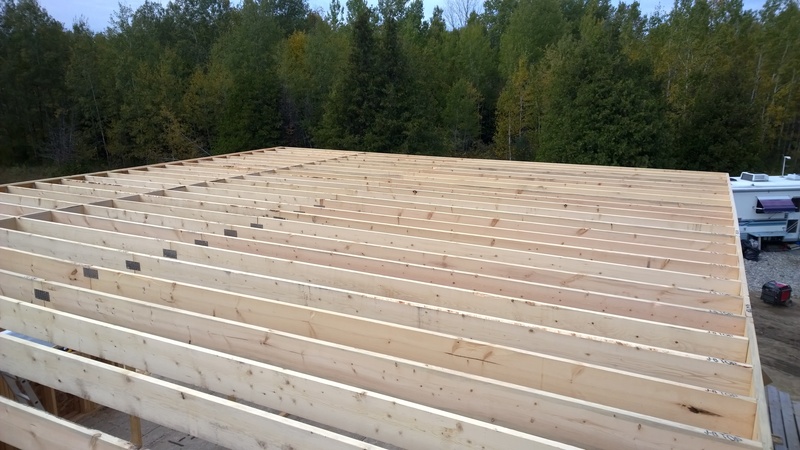 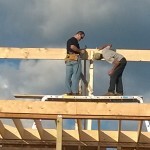 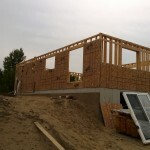 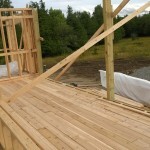 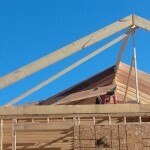 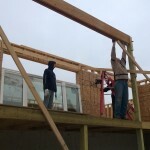 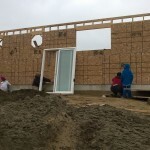 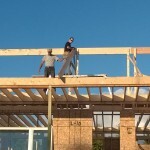 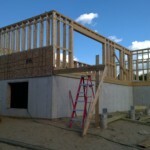 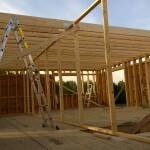 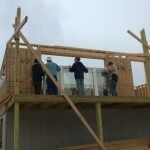 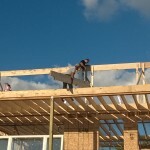 This involves taking two, 2″x10″ beams, about 16′ long each, and then joining them together with a metal connector in the middle to form a huge 32′ long beam that spans the house from the front of the porch to the back of the house. Each connector for the join take 32 nails, so 64 nails total for each beam (one connector on each side). 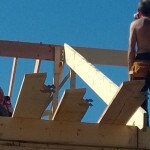 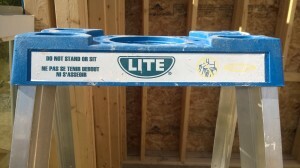 I was able to get seven of these joists completely installed today before I had to call it quits. 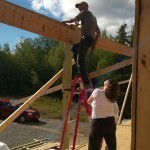 I feel this next picture is self-explanatory…don’t try this at home kids! 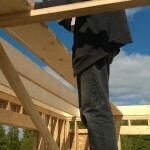 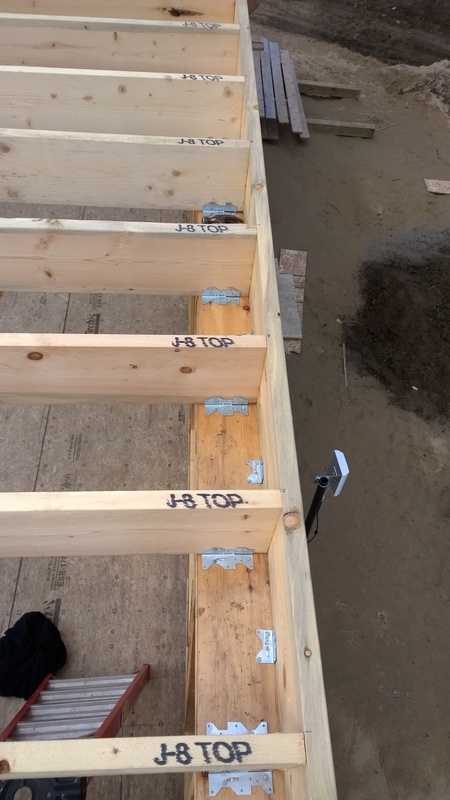 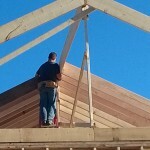 Today I continued working on the attic framing – the first step of which is installing the rim joists which run around the whole perimeter of the house, including out and around the porch frame / headers. 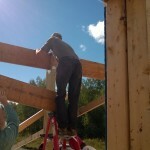 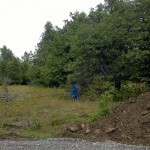 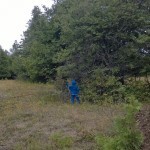 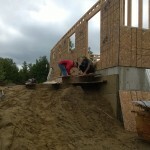 Here’s a couple pictures that Heather took while I was doing some of the trickier bits! 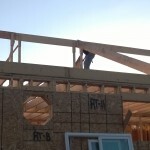 Tomorrow I’ll finish nailing those up and the get started with the attic joists! 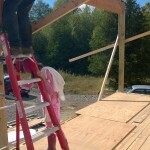 Today we got a lot accomplished. 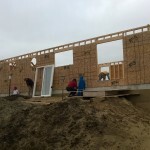 Heathers uncle Paul was still here, so he managed to finish off the last of the interior perimeter walls, and Heathers brother John David and his family were here to help also. 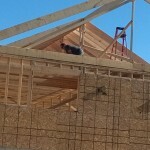 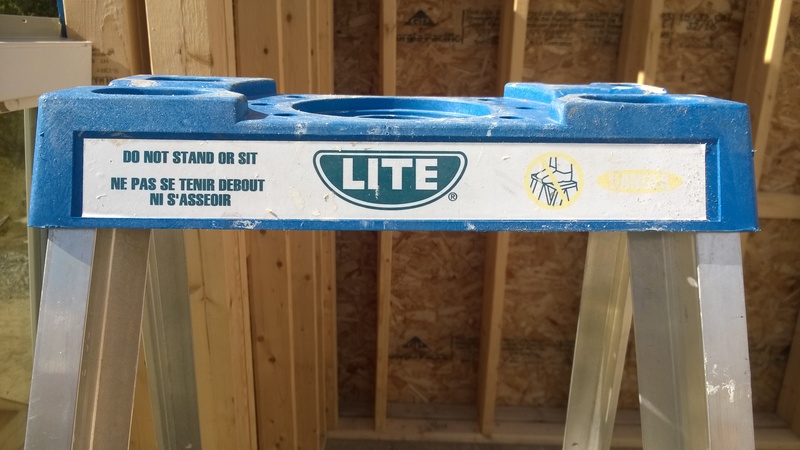 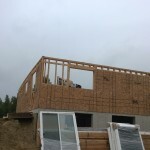 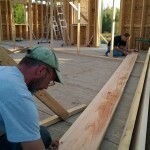 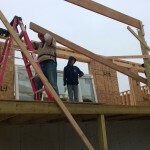 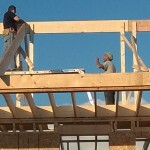 They started out by helping drive nails for the sheathing – we have to drive a nail every 6″ so every bit of help here really counts…it’s reasonably easy work but it sure takes time! 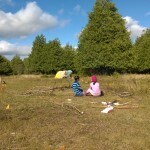 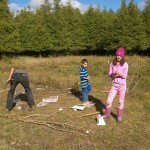 While we were doing that, Heather took the kids to collect firewood for a small fire at the end of the day. 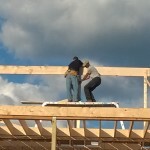 Finally, one of the last tasks that I really needed help with, and that I couldn’t do alone, was lifting the last three headers into place on top of the porch posts. 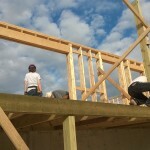 Yesterday when my cousin Jonathan and I lifted the first three headers into position, he was doing most of the lifting – today, it took four of us to do what he did nearly singlehandedly. 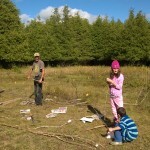 We rounded out an entirely successful day with a small fire and some marshmallow roasting for the kids. 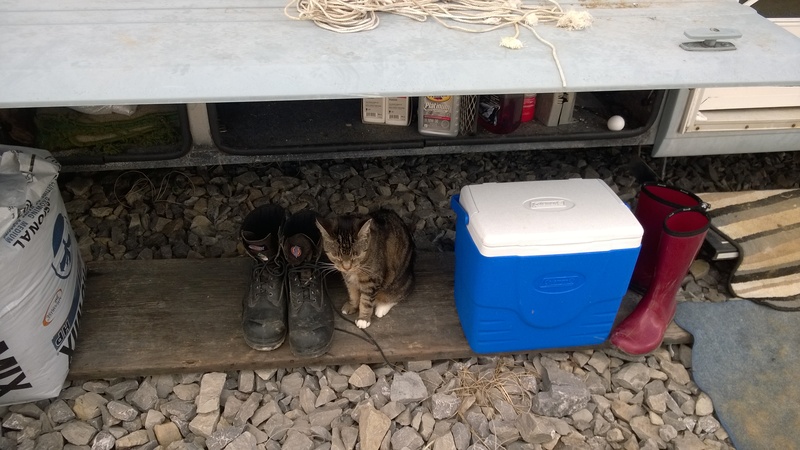 I just wanted to take a moment to really issue a heartfelt thanks to Uncle Paul as well as John David, Danielle, Beatrice and Lionel. 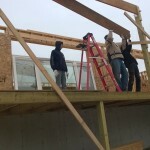 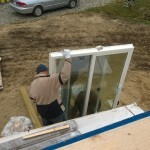 It was really super having the extra help and goes a long way to getting us a weathertight shell! 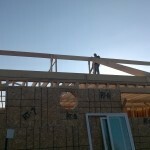 It’s getting chilly outside in the mornings and with every passing day winter is getting closer. 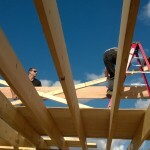 Thanks for reading and hopefully you enjoyed the pictures! 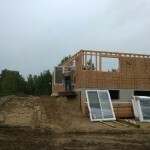 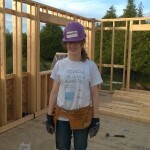 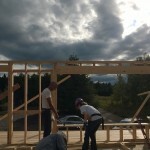 Yesterday and today Heathers uncle Paul was here again helping us out – he was working on framing up the last of the interior perimeter walls, while Heather and I spent the day putting up the last of the wall sheathing. 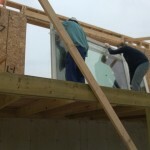 This morning, my cousin Jonathan came by with his son Ashton to help us move the picture window and the patio door from where they were temporarily placed, to closer to their final destinations. 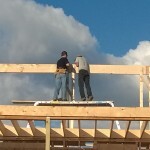 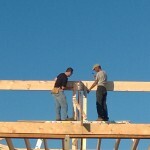 They also helped us install three of the LVL headers on top of the porch posts, which will help support the roof. 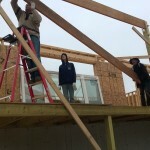 Tomorrow we expect to have even more help on hand, with continued assistance from uncle Paul and also expect to have Heathers brother John David and his family around to swing some hammers! 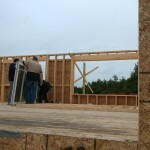 I’ll try and post some more updates end of day tomorrow, hope you enjoyed the pictures and thanks for reading! 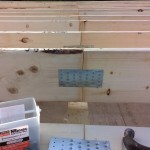 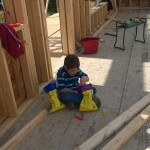 More Wall Sheathing, with Help! 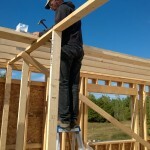 Yesterday and today we continued applying more wall sheathing, and today while we were at it, we were joined by our friend Graham who was more than happy to come out and swing the hammer a few times! 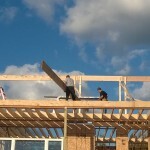 Stay tuned and wish us some good weather to get this done before first frost! 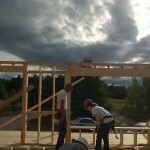 Today was a big day, we got a ton done thanks to Heather’s Uncle Paul and cousin Marguerite stopping through to help out. 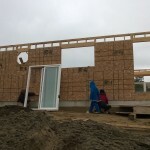 I was able to set them to task assembling more of the inside perimeter walls – they got two sections almost completely finished so there are only two more sections left! 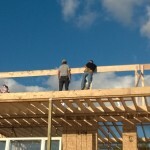 While they were doing that, I was busy with Heather assembling the rest of the porch frame and dry fitting the cedar decking to make sure things will go together as expected. 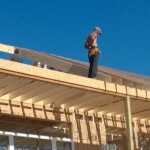 Hope you enjoy the pictures, thanks for reading! 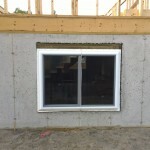 Yesterday we managed to test fit the basement window from my last post, in the actual window frame I built in the opening in the basement wall – it fits really well and is almost perfectly level and plumb, which is great! 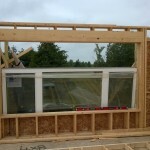 Now I can create three more window frames for the other three basement windows, and get those installed and out of the way. 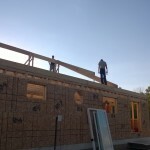 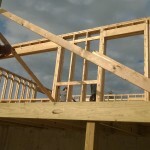 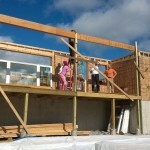 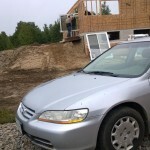 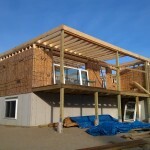 We also nailed up the first three sheets of sheathing on the side of the house, and started assembling the porch frame. 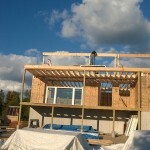 Today we will probably finish the porch frame and do some more sheathing. 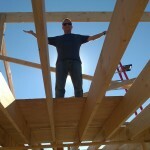 Have a good day and thanks for reading!